– Mae Jemison, as quoted in the Huffington Post Jemison is the first black woman astronaut and holds both a medical degree and a bachelor degree in chemical engineering. Contact us at Peg@CreositySpace.com for ways to work with the community and businesses to help bring CreositySpace into your school. "It is undeniable that there is a disconnect, especially at the elementary level, between technologies and companies that exist (or are on the rise) that have potential to change the way we view the world. It is tremendously beneficial for elementary students to learn about these technologies and companies." CreositySpace has spent the last three years developing its materials in collaboration with teachers and students from third, fourth and fifth grade classrooms across the Capital Region of New York. 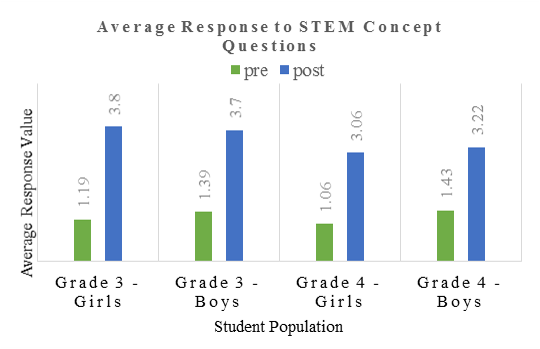 Initial evaluation of program efficacy was performed via informal surveys that probed how much students felt they had learned, what they knew about science, and what they wanted to be when they grew up. Across all grades and both genders students felt they had learned more about a given topic after participating in the CreositySpace program. As we continue to develop the program we are working with a number of universities and federal agencies to align our impact assessment with methods that are accepted in the field. Where possible, we intend to track cohorts of students through upper elementary school, into middle school and beyond to demonstrate that connecting kids to STEM through the values and qualities of entrepreneurs and innovators, forms lasting and effective impressions.